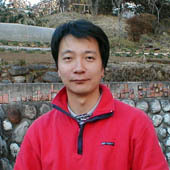 Mitsuo has been making new games for 20 years in Japan. 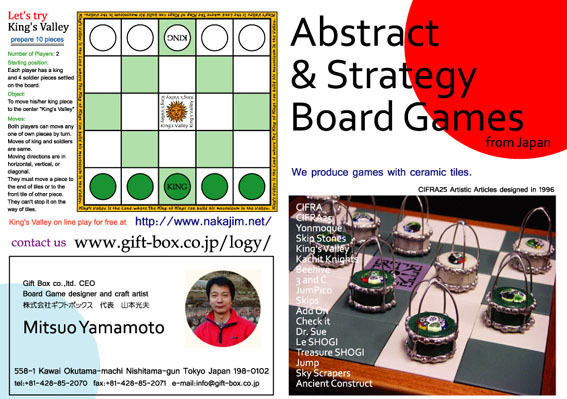 There are now more than 30 games and almost all are abstract strategy board games designed with original rules and game mechanics. 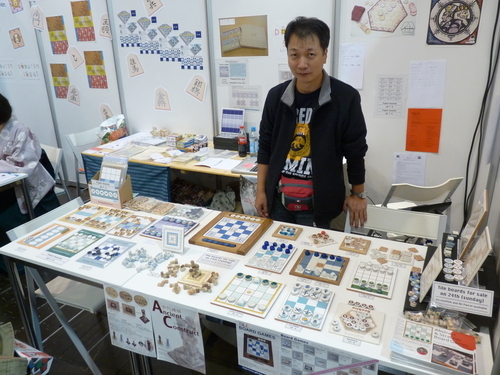 He is not only a game creator but also a ceramic paint artist and usually makes his game products with self-made ceramic tiles painted by hand. We had a presentation of games at "Spiel-Tag" game show Essen Germany in 2010. Many persons enjoyed playing with our games and we could have a good presentation. Board games which made by ceramic tiles are novel in the world. Their beauty is outshining at the show. Work studio is located in Okutama Tokyo Japan. Okutama is most west part of Tokyo. Here is almost mountain area and nature is very beautiful. Good ideas are born here and beautiful articles are produced by hand made. Art works about ceramic tiles shows Okutma Tile Art Factory web site.